southern orders : HOW DID THE FORTRESS OF THE PRE-VATICAN II CHURCH, WITH ITS DISCIPLINE, SOBRIETY, ASCETICISM, CLARITY AND ROMAN UNIVERSALITY COLLASPE OVERNIGHT? HOW DID THE FORTRESS OF THE PRE-VATICAN II CHURCH, WITH ITS DISCIPLINE, SOBRIETY, ASCETICISM, CLARITY AND ROMAN UNIVERSALITY COLLASPE OVERNIGHT? I am not anti-Vatican II, but I am “anti” its ambiguous spirit that spread throughout the Church overnight like polio prior to the vaccine. I am convinced its demonic spirit of licentiousness, personal freedom, elevation of disordered conscience as well as ambiguity, confusion and a breach of what preceded this spirit, contributed and contributes mightily to the ugly distortion of the Sacraments of Holy Orders and the Most Holy Eucharist in blasphemous and sacrilegious ways as seen in the recent Pennsylvania Grand Jury Report. It exacerbated any pre-Vatican II sexual abuse there may have been and its mismanagement by the hierarchy from the top down to demonic proportions! I despise those who dogmatize Vatican II which was a pastoral council and try to make infallible its spirit especially those things to which there can be legitimate dissent as expressed by the SSPX. Rather than canonize Blessed Pope Paul VI, which in reality is a canonization of Vatican II’s 1960’s spirit of euphoria that Pope Francis so loves, maybe because it reminds him of His Holiness’ youth, the pope and bishops, priests and religious of the Church should do a thorough examination of conscience and return to the Church the great discipline, asceticism and sobriety as well as clarity of the pre-Vatican II Church to the present day. How bad would tightening up things be compared to what has happened to the Church which is nothing short of a moral catastrophe since Vatican II and precisely because of its demonic spirit and openness to the world--as St. John's Gospel understands the term "world." 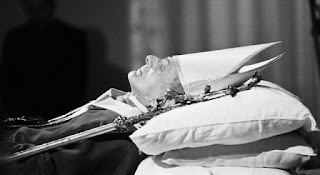 But it is important to know that Blessed Pope Paul VI who suffered from the drug-like induced euphoria at the conclusion of the Council was quite chastened and was experiencing a terrible withdrawal from it by 1967 and certainly completely chastened by the time of his death. The liberals, both faculty and seminarians of my seminary in Baltimore absolutely despised Blessed Paul VI by 1976, because of Humanae Vitae and his disavowal of Vatican II’s spirit toward the end of his pontificate. Pope Paul VI really believed he was doing the right thing to honor the work of his predecessor. Cardinal Suenens was very much a "spirit" of Vatican II bishops and singlehandedly helped to give universal approval to the infiltration of Protestant Pentecostal worship and praise, speaking in tongues, prophecy, deliverance, raising of hands and the like of the late 1960's. He was the celebrant for a packed St. Peter's Basilica of those who had abandoned Catholic spirituality and sobriety, especially at Mass, for this new movement called Catholic Charismatics. Why, because it was Protestantizing the Church to help erase Catholic identity as it was known prior to the Council. Do you remember Sept. 11, 2001? Do you remember how we all watched in horror, dumbstruck and helpless, as those two buildings in New York burned, imagining the thousands of people inside? Do you remember the horror as the first tower collapsed---the unbelievable sight happening right before our eyes? Do you remember watching, fearing the impossible could happen - the other tower could collapse - and then seeing it happen? Do you remember the deep pain in your heart in the days that followed, and the tears that welled up unexpectedly and fell from your eyes? We have been experiencing this same sort of event in the Church since Vatican II, only in slow motion. And we have had to stand by as the destroyers danced and rejoiced at the destruction, scorning us, mocking us, telling us how wonderful what they have done was, and asking for more money to support their work. Fr. Allan J. McDonald said... "Cardinal Suenens was very much a 'spirit' of Vatican II bishops..."
And one of his best buddies was the archbishop of Atlanta, Paul Hallinan, who is part of "the Cleveland connection" and who also was pals with Hans Kung and of course Bernardin. Agree. It would seem prudent, given recent events, to put off the rush to canonize Blessed Paul VI. At least delay completion of the process until there is adequate time to reasonably, rationally and truly understand Paul's life/virtues/writings and holiness as a contribution to that era and its resulting continuity or, lack thereof relative to the Church's prior, organic history. Well, Bee certainly nailed it. Bee's analogy is exactly right! Very well said. McAllen, great seeing you last Sunday at the Cathedral’s EF Mass. Mallen! Auto correct is going to be the death of me! Bee is fortunate to attend a real Catholic parish - St. John Cantius! Thank you , Father. It was wonderful to be there. Hope to be back soon!